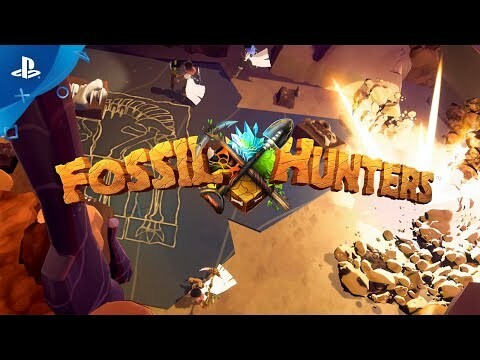 An action-adventure game about digging for fossils and building your own dinosaurs. Arrive at a mysterious dig site on the promise of uncovering the most incredible fossils the world has ever seen, only to discover that the camp is abandoned. On the urging of a voice on the radio, known only as the Collector, you'll delve deeper into the earth in search of fossils, treasures, and clues as to the whereabouts of missing fossil hunters who came before you. The completely modular fossil block system allows you to build any way you like, creating skeletal creatures of varying sizes and complexity. Avoid cave-ins and monsters who will get in your way or even damage your fossils. Buy equipment to protect your discoveries and bring back treasures to your lab for safekeeping. A field journal filled with notes, sketches, and artifacts will document your discoveries. Explore every corner of the caves to find powerful items and unlock the secrets of the deep. Up to four players can explore and build together in frantic local co-op.